Udupi, Dec 07, 2017: Art of Living founder Sri Sri Ravi Shankar on Wednesday said that a Ram Temple should be built in Ayodhya by talking to all stakeholders. 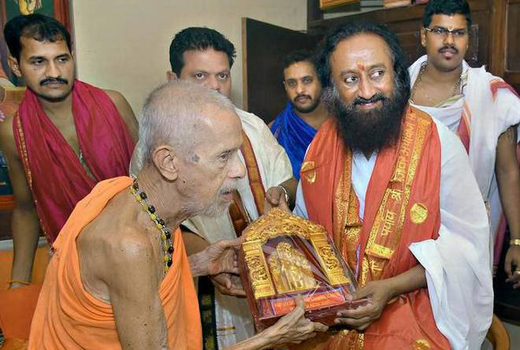 Sri Sri Ravi Shankar visited the Sri Krishna Mutt/Temple and also held talks with Vishwesha Tirtha Swami of Paryaya Pejawar Mutt. Sri Sri Ravi Shankar told presspersons here that efforts were being made for the construction of Ram Temple by holding cordial talks with all the stakeholders involved in the dispute. He had been meeting all those concerned on the issue of Ram Temple, including leaders of the Muslim community. There had been positive response to his efforts, he said. On the RSS holding a contrary view of his (Sri Sri Ravi Shankar’s attempts) to resolve the Ram Temple dispute, he said that he would not like to comment on their opinion. “People are free to hold different opinions,” he said. When presspersons sought the Pejawar seer’s comment on the 25th anniversary of the demolition of the Babri mosque in Ayodhya, the seer said that he had only given his nod for a symbolic kar seva at Ayodhya. But some persons among the large number of people who had gathered near the disputed structure in Ayodhya on December 6, 1992, became aggressive and demolished the mosque. “I immediately objected to it and even scolded some on the spot. Later, when some seers decided to install an idol of Lord Ram, I did not go there because I was saddened by the incident,” the seer said. On the reported statement of former Chairman of Karnataka State Commission for Backward Classes C.S. Dwarakanath that there was no proof of birth of Lord Ram, the Pejawar seer said that people believed in Lord Ram. “It is not right to question the belief of the people. Will Mr. Dwarkanath make such comments about other religions?” the seer questioned.